and Delmas, 1987; Dclmas ct al., 1992), allowing us to estimate the associated stratospheric loading and resulting changes in optical depth. Indeed, ice core data provide series of the three candidate external forcings for the past century (greenhouse gases, solar irradiance, and explosive volcanism) and are thus key to the attribution of climatic changes during the last millcnium. The fact that ice cores give unique and direct access to records of changes in atmospheric composition has played a key role in demonstrating the close association between C-O2 and CH4, and climate variations at the glacial-interglacial time scale (Delmas et al., 1980; Neftel et al., 1982; Barnola ct al., 1987; Stauffer et al.f 1988; Chappella/ et al., 1990; Raynaud et al., 1993). This discovery comes, in particular, from the core drilled at Vostok in East Antarctica, which fully covered the last glacial-interglacial cycle in the 1980s. 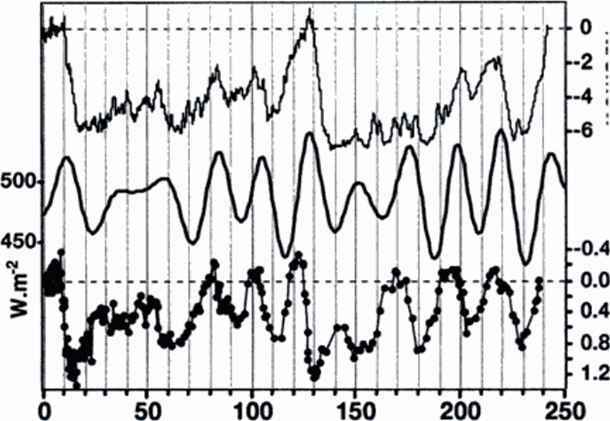 The later extension (Jouzcl ct al., 1993,1996; Petit et al., 1997) of this ice core now permits an examination of this relationship between climate and greenhouse gases over four climatic cycles (Petit ct al., 1997). This extension of the greenhouse gas record (Figure 15.7) confirms that present-day levels of CO2 and CH4 are unprecedented during the last 420,000 years. 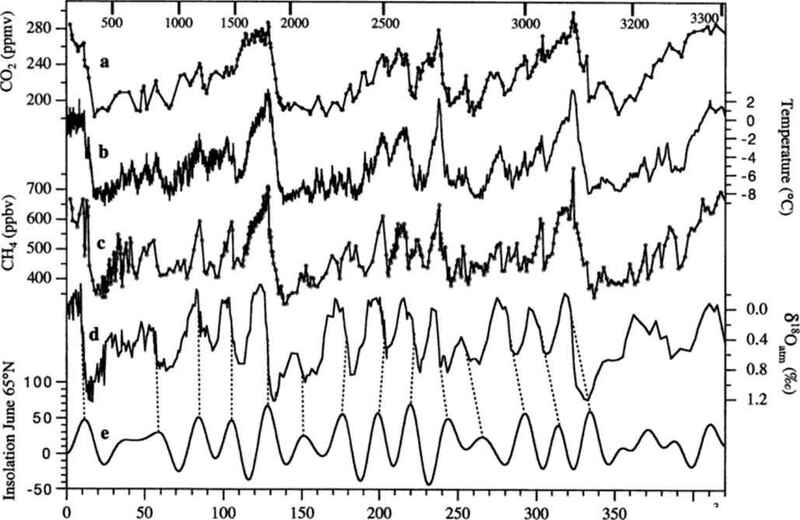 The overall correlation between CO> or CH4 and the Antarctic isotopic temperature is remarkable at the low resolution of this long record, which docs not describe millcnial-scalc events (r2 = 0.71 and 0.73, respectively, with only little change from one glacial-interglacial cycle to the next). This high correlation indicates that CO2 and CH4 may have contributed to the glacial-interglacial changes over this entire period in amplifying the orbital forcing, along with albedo and possibly other changes. Interestingly, the comparison of climate changes and climate forcings at the glacial-interglacial time scale gives insight into the estimate of the climate sensitivity (Lorius ct al., 1990), suggesting that amplification processes have, as predicted by climate models, operated in the past. Petit et al. (1999) estimate that the direct radiative forcing corresponding to the CO2, CH4, and N2O glacial-interglacial changcs may reach up to 0.95 °C This initial forcing is amplified by positive feedbacks associated with water vapor, sea ice, and possibly clouds. This total glacial-interglacial forcing is important Wm ), representing 80% of that corresponding to the difference between a 2 x CO> world and modern CO2 climate. Results from various climate simulations (Bcrger et al., 1998; Weaver et al., 1998) make it reasonable to assume that greenhouse gases have, at a global scale, contributed significantly (possibly about half, i.e., 2 to 3 CC) to the globally averaged glacial-intcrglacial temperature change. Indeed, the fact that glacial-intcrglacial temperature changcs arc large (^5 °C) and that associated changes in greenhouse gas concentrations are well known offers an interesting opportunity to estimate global climate sensitivity. This approach, however, has limitations because climate feedbacks may operate in a different way for a 2 x CO2 than for a glacial climate (Ramstein et al., 1998). Figure 15.7. Vostok scries w ith respect to time for (a) C02, (b) isotopic temperature in the atmosphere, (c) CH4, (d) 5,80 and (c) June insolation at 65°N. Adapted from Petit ct al. (1999). Figure 15.8. Variation during the last two climatic cycles of (a) the deuterium content at Vostok, (b) the 65°N mid-June insolation, and (c) the oxygen 18 content of atmospheric oxygen as measured in air trapped in the Vostok ice. This figure is adapted from Jou/el ct al. (1996). in atmospheric composition; they also shed light on the complex interactions between climate and biogeochcmical cycles. The rccord of the oxygen 18 ratio in atmospheric oxygen (Figure 15.8) gives one example of such interaction between insolation changes and biogeochcmical cycles. This parameter depends both on the isotopic composition of the occan (and thus on change in ice volume) and on the rate of continental-to-oceanic biomass, which itself is largely governed by the hydrological cycle in mid-latitudes. The presence of a strong prcccssional periodicity in this record (23 kyr) is attributable, at least in part, to the influence of precession on monsoonal activity. Over the past two decades, ice core data have made a significant contribution to the increased recognition of paleoclimatology by climatologists. In this review, we have focused on the relevance of these data to future climatic change and have pointed out how they arc useful (1) to assess climate variability at various time scales, (2) to provide estimates of climate forcings and information on climate sensitivity, (3) to shed light on climate mechanisms, and (4) to draw attention to the possibility of "climatic surprises." 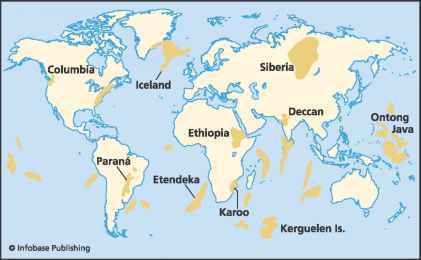 1GBP (International Geophysical Biological Programme) through the PAGES (Past Global Changes) projcct, and within WCRP (World Climate Research Programme) through the CLIVAR (Climate Variability and Predictability) project.